VEGAS DVD Architect & NewBlueFX Filters Ultimate + NEW: HitFilm Movie Essentials. 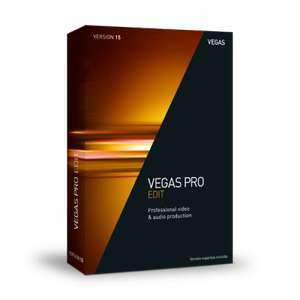 So that's a saving of £194 against Vegas Pro 15 which is already on offer. Topcashback are offering 21.21% which if off the Gross price would bring it down to ~£91; thanks to spannerzone. The better deal is for Samplitude PRO X3 SUITE via the US site for $149 versus the current offer of £450 in the UK; with Paypal it comes to ~£115. Plus it comes with SpectraLayers Pro 4 until December 6th but only from the US site; that retails for £299 by itself. SOUND FORGE Pro 11 full version; usually £299. See first comment for US link. Better to buy Samplitude from the UK Site and go via Topcashback as they are offering 21.21%. It's possible they won't pay out as its an offer but worth a try as potentially that reduces it from £115 down to ~£91. I used to love this program.. was way ahead of its time for DVD Authoring and video editing. Looks good, I know that with the home version the bundled extras for effects are always a lite version and somewhat underwhelming. If you're updating an older version or home version then you might have the DVD architect software I guess. Nice one and they and Quidco are offering ~20% for Magix but probably only for the UK site; you can try copy and pasting the US link from within the UK site. I will consider it but as you say do I need those features? I have just acquired an RX100 M4 which has some fancy very high frame rate capture modes as well as 4K so maybe it would be a good match! I will consider it but as you say do I need those features?I have just …I will consider it but as you say do I need those features?I have just acquired an RX100 M4 which has some fancy very high frame rate capture modes as well as 4K so maybe it would be a good match! Have you tried DaVinci Resolve 14 which is free? My impression is that it's not a fully featured Editor but has some great features. How do I use it? What if I buy vegas on amazon, would that work? I didn't post this deal because I was going to buy it but now I am really tempted. If everyone who voted hot would donate 50p per degree of heat they gave it would nearly cover the price. The difference between this and version 14 is so small, not worth the upgrade imo. Voted hot though for great price! Gosh, I just ordered it Oops!